It was an idea that never should have worked. A British folk-rocker joins up with alt-country outliers to put music to the unreleased lyrics of Woody Guthrie. It wouldn’t have surprised anyone if it had diminished the reputation of all involved. 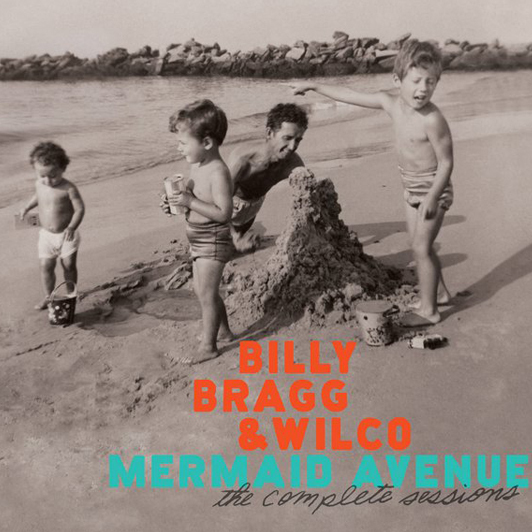 Instead, Mermaid Avenue, performed by Billy Bragg and Wilco and released in 1998, was a revelation, proof that Guthrie was far more than the populist, fascist-bashing folkie that he was often perceived to be. He was also capable of startlingly personal songwriting that was far ahead of its time. Volume 2 was released just two years later to more raves. Now, on the 100th anniversary of Guthrie’s birth, a massive repackaging of the material once again brings this amazing and unique collaboration back into the limelight. The highlight of the release is a third CD of unreleased material from the sessions. For those who already have the first two CDs, Volume Three doesn’t quite reach those lofty heights, but it’s by no means a bunch of also-rans. What’s truly wonderful about the release is that it puts the first two albums in front of a whole new generation of listeners. On Volume 1, we get to see what Wilco might have sounded like had they stayed on a more traditional path. Their achingly lovely takes on “At My Window Sad And Lonely” and “One By One” still can break hearts, while “California Stars,” with music written by frontman Jeff Tweedy and the late Jay Bennett, remains the album’s signature song. Only on the whooping and hollering “Hoodoo Voodoo” does Tweedy’s anarchic spirit come to the fore. Bragg is no slouch on the first album either, and if his offerings are less musically versatile than Tweedy’s, they put more of the spotlight on the potency of Guthrie’s lyrics. Check out “Ingrid Bergman,” sweet and ribald all at once, and “Eisler On The Go,” moody and powerful. While Volume 2 might not have as many standout songs as the first, it makes up for it with its diversity. Musically, it makes room for the Byrdsy jangle of “Secret Of The Sea,” the punky “All You Fascists,” and some classic Wilco weirdness on “Someday Some Morning Sometime.” Lyrically, it shows that Guthrie had a lighter side, what with odes to flying saucers and Joe DiMaggio. Ultimately, those lyrics are the main feature to recommend this mammoth release. On masterful songs like “The Unwelcome Guest,” and “Remember The Mountain Bed,” Bragg, Tweedy, and company need only get out of the way and let the mesmerizing wordplay work its magic. The Mermaid Avenue project is essential for showing that Woody Guthrie could illuminate what was going on inside of him as well as he could detail the plight of his fellow man.